That’s as much of the rather chatty blurb I’m prepared to share – the rest of the plot is unspooled with such skill and pace it would be shame to give you any spoilers that would interrupt your own enjoyment. The first person narrative sucked me in from the opening lines as this desert-based YA fantasy adventure starts with a bang and doesn’t let go. Amani, orphan and skilled shot, is desperate to leave the scruffy, dead-end town where she grew up in the desert. As the consequences of her escape plan catch up with her, Hamilton takes us on a journey across a vividly depicted landscape peopled with ghouls and other monsters. This is a world of djinni, sand horses and half-breed godlings with forbidden magical powers. The desert is almost a character in this richly drawn world with a real otherworldly feel as Hamilton has heavily borrowed from Eastern myths and legends. As Amani careens through the parched landscape, constantly on the run, we learn more about her backstory, the current political situation and more details about her mysterious travelling companion also emerge. There are major reveals along the way that continue to notch up the stakes and increase the tension, further locking me into the story until this one was a constant struggle to put down until I finished it in three greedy gulps. The climax is well handled with the ending leaving me wanting more of this world and to discover what happens next to Amani. Fortunately I don’t have to wait too much longer, as Traitor to the Throne is due to be released in February 2017. I look forward to tucking into the next slice of this excellent adventure, which comes highly recommended. Receiving a copy of Rebel of the Sands from the publisher via NetGalley has in no way affected my honest opinion of this book. You might be able to have another go – they are keen for folks to continue to review it as it is short-listed for the Costa Prize, I think. It could be worth re-applying for it. I’m glad you liked the review – I really enjoyed this one, which left me buzzing. Nice review, Sarah. 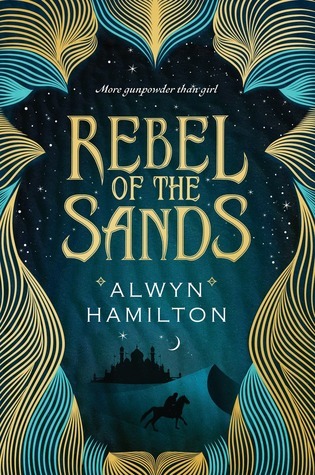 I’d read a couple so-so reviews of Rebel of the Sands earlier this year, and that made me shy away from it. (That and the fact that I’ve had hit-or-miss luck with YA fantasies this year… ) But like I said when I commented on your Sunday post, maybe I’ll rent it from my local library instead of buying it. Oh, definitely order it from the library – I thoroughly enjoyed the world and found Amani to be an engaging protagonist. I’m looking forward to reading the next instalment:).